Okay, folks, it's that time again for your buddy and pal to review something completely otaku-related. Again. This time we have the second installment of The Disappearance of Nagato Yuki-chan. While the art is pretty much the same as the previous installment, I think that maybe I have gotten a bit used to seeing the characters drawn this way. But I still like the art less than the anime or the illustrations in the light novels. 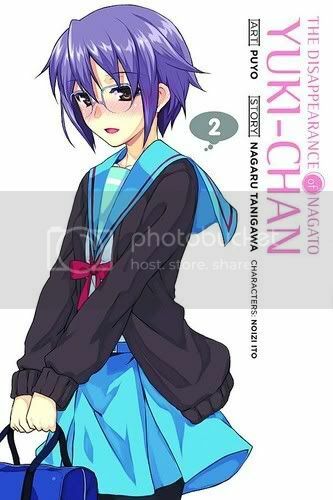 It also seems less weird for Nagato to seem so talkative for being such a shy girl. I guess that means either she's more out of her shell then she was in The Disappearance of Haruhi Suzumiya or Tanigawa just made a few creative changes to the story to fit this different vision. Haruhi and Koizumi enter the picture in this installment and they more or less join up with Nagato, Kyon, Ryoko, and eventually Asahina to create this timeline's SOS Brigade. Of course, now it really is just a normal unofficial club instead of one that happens to contain an ESPer, a time traveler, and an alien. And it isn't named the SOS Brigade either. The most unusual thing about the club is that it features members (Haruhi and Koizumi) who don't go to North High School. I always thought that Koizumi was kind of a useless character in the light novels (although he had his moments), but so far it seems like Mikuru is also apart of the useless character brigade along with Koizumi in this manga. That is probably my least favorite change so far. Mikuru not being a clumsy time traveler dressed like a maid simply offends my senses. Later issues better put her in a maid outfit. While the first volume seemed sort of rambling and without a coherent plot this second volume seems to go straight for the meat of the story setting up a Kyon/Haruhi/Nagato love triangle. Again, I don't really prefer this story becoming a romantic comedy type, but it is decent enough in its own right. Had it been named something else and featured different characters then this manga probably wouldn't be as interesting to me. I mean, it's really just your typical high school romantic comedy with a few familiar faces thrown in the mix. Only this time we have a shy quiet girl as the main character instead of a shy quiet guy. But I am a sucker for this type. If you are a fan then you probably have already read it or probably will just because it is somehow related to The Melancholy of Haruhi Suzumiya. If you aren't a fan then you probably won't care and that's fine, too. I liked it. Not sure if it is quite worth six bucks considering how short it is, but hey, I don't set the prices and I am always talking about supporting the genre so I do put my money where my mouth is.